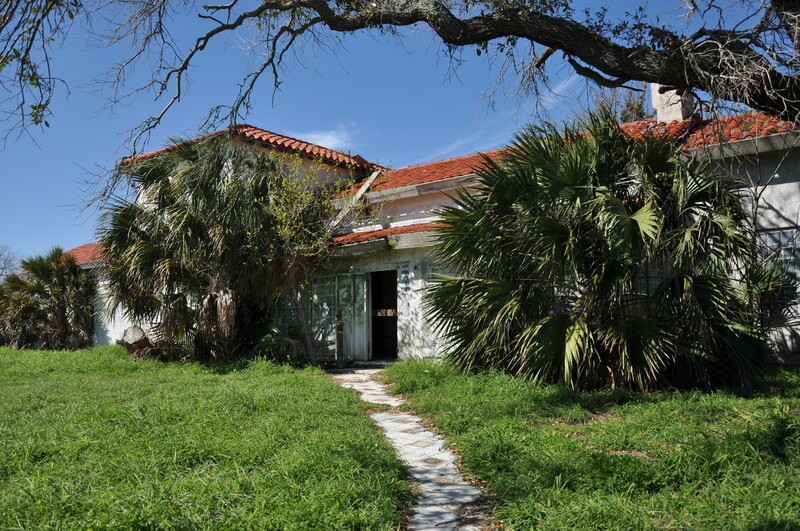 Nestled within the gulf coast, on an island known for its abundant history sits the ruins of what was once a beautiful home. Upon entering I came through an arch that still proudly stood presenting this beautiful Spanish style “Mansion”, though compared to the other mansions on this island the title is a bit pretentious. 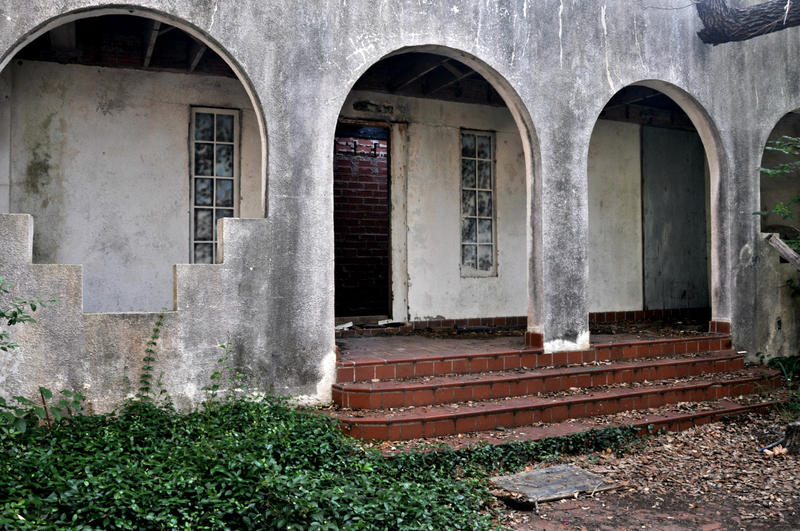 The house was designed and built by a famous “union-buster” and industrialist in 1928 but he never lived in it. 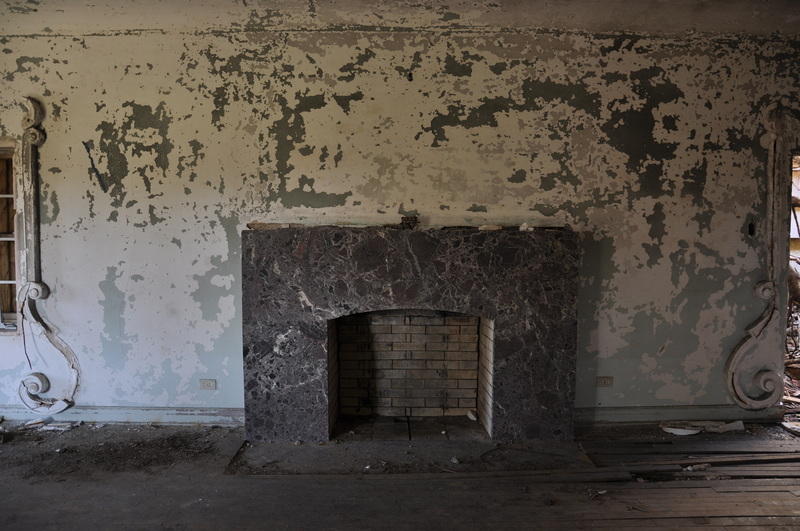 In 1931, the mansion was sold to another man, who lived there with his family until 1950, when his wife and children died and he later died from a heart attack. After parking in the back of the house, in the driveway, I entered what was once a truly beautiful courtyard. 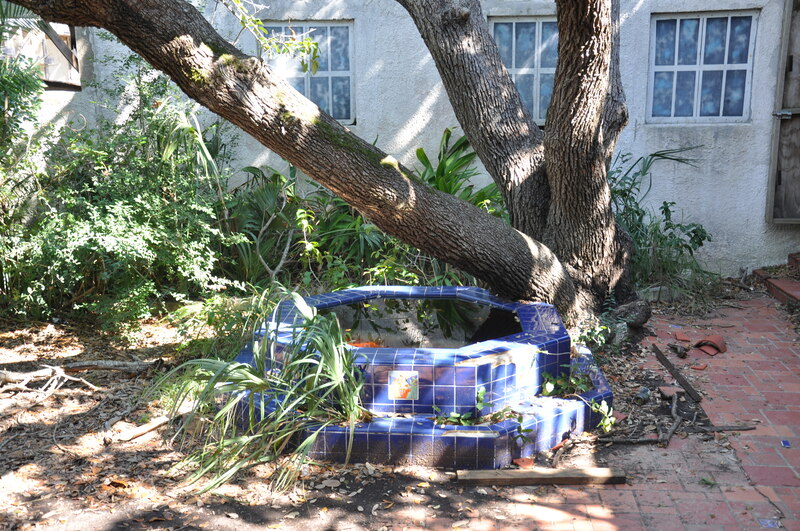 It had a small fountain that was now being overtaken by a thriving, untamed oak tree and a fireplace. 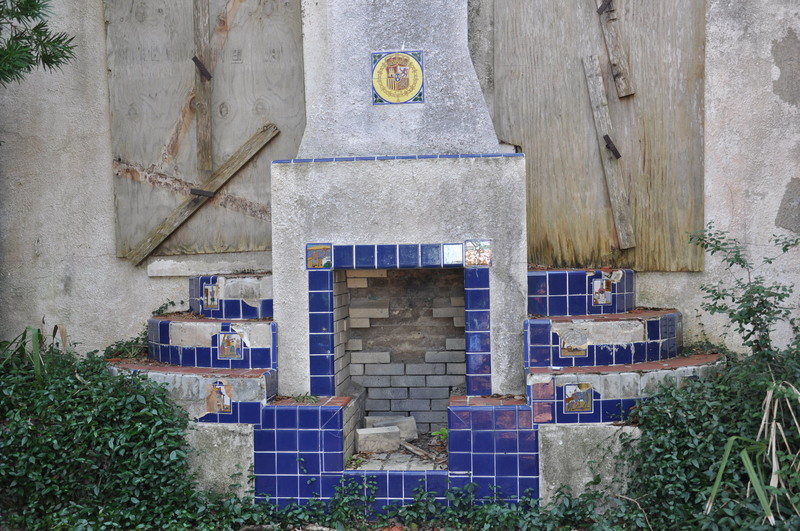 Both the fountain and fireplace were tiled and had small hand-painted tiles that depicted various parts of the Spanish take-over of the island. On the walls of the courtyard lay gorgeous tiles represented small Spanish style scenes. 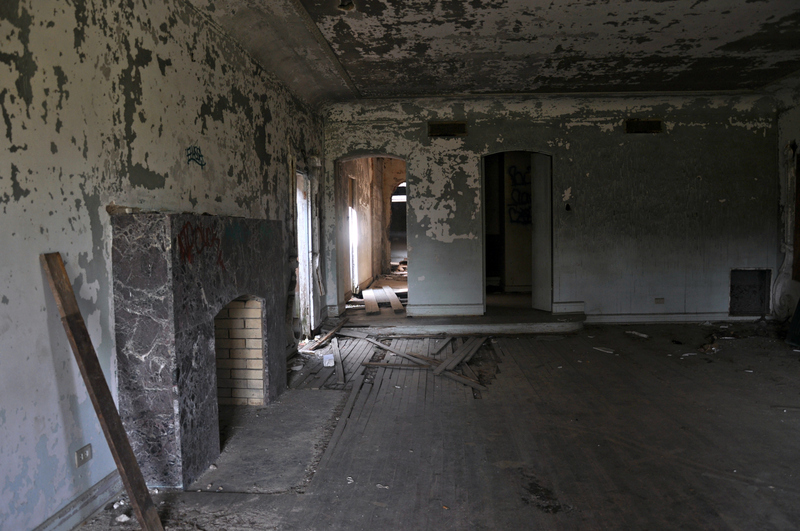 Walking up the steps connected to the balcony, I could look into the house in the rooms that appeared to be a hallway, a small closet and the entrance to a room that has burned long ago. The mansion has caught fire a couple of times and has suffered a lot of abuse. 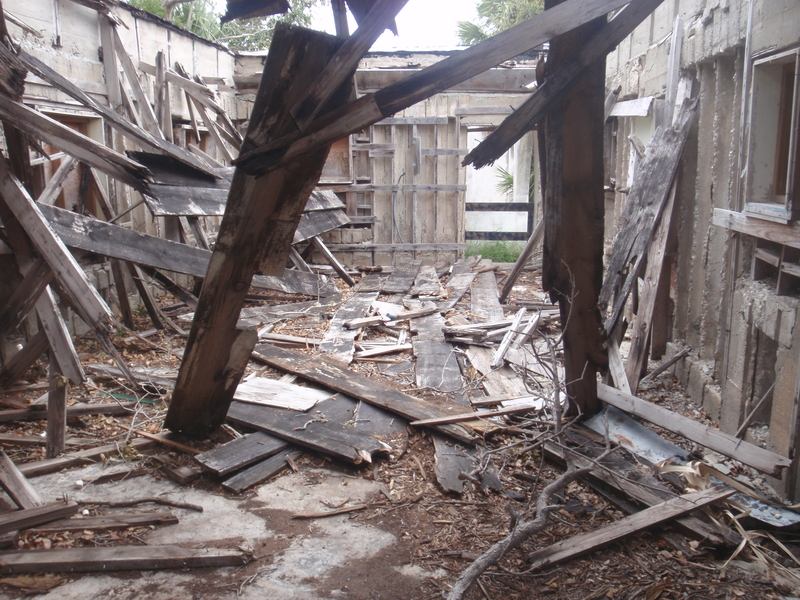 Parts of it have been demolished and others have simply been torn up by people who have come and gone. Through the courtyard, walking through the house, the west room is what appears to be a ballroom of sorts. 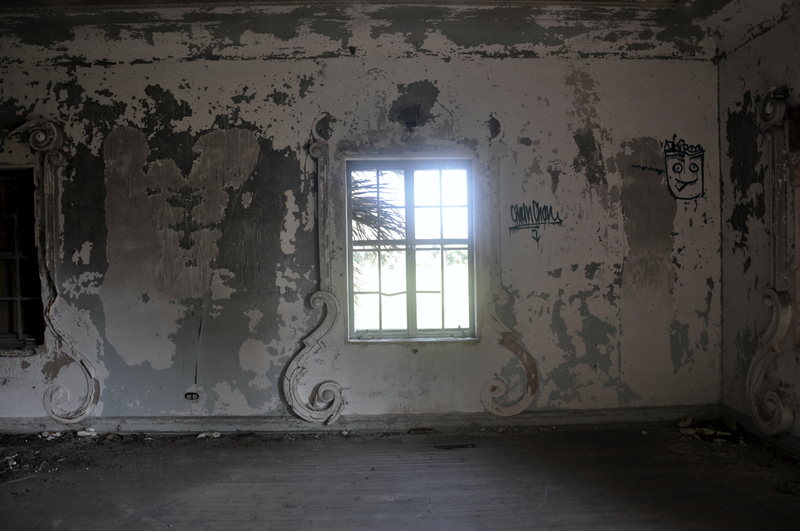 The windows all adorned with a gorgeous trim around each one, and the whole room was centered with a fireplace. Walking into the front room of the house, I was greeted by pirates. Each all has massive pirate murals on them! The centerpiece of the whole thing was on the second level. Looking down upon the front room was the infamous Pirate Jean Lafitte. 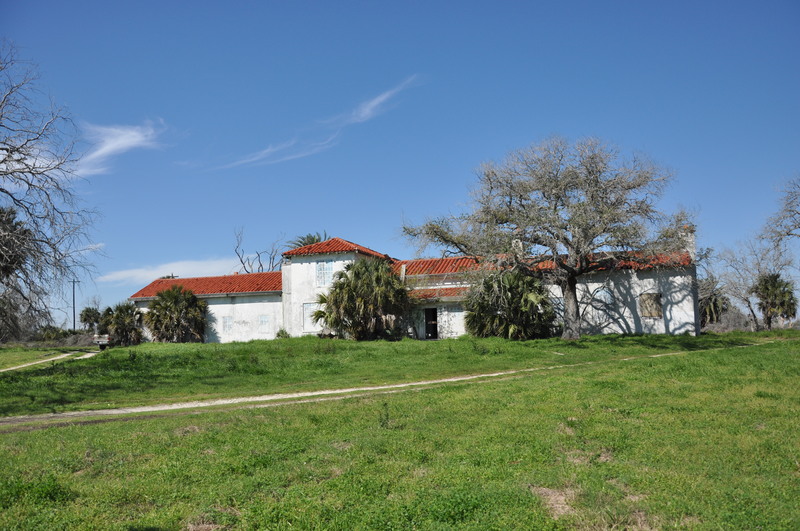 This mansion used to sit on a massive plantation that is now mostly a state park, but before that is was always rumored to be the place that Lafitte buried his treasure when he was running the island in the early 19th century. 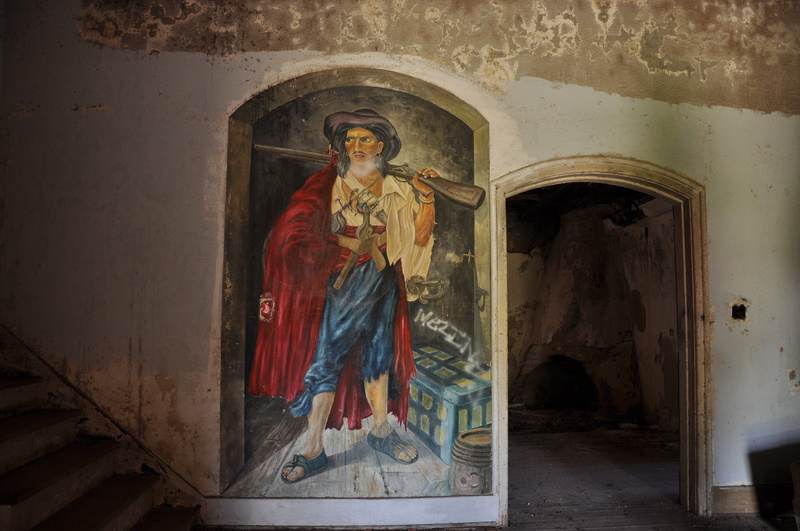 The pirate and his crew took over after the battle between them and the Karankawa Indians in 1821.Shortly after, Lafitte was asked to leave by the United States government after they got tired of his constant preying on the ships in the gulf, but his legends live on and are preserved on the very walls of the mansion. 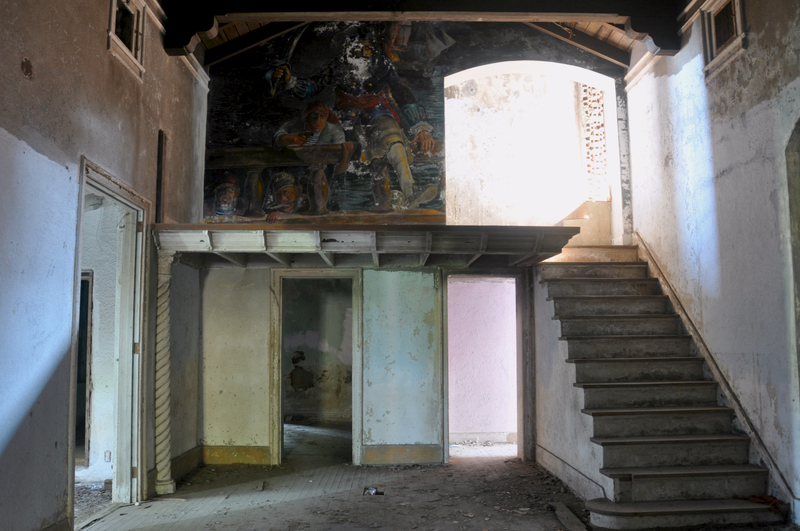 The murals are truly a highlight and permanent charm of the mansion, as they keep alive the memory of another chapter of the history of the island and the charm of the pirate mystique. At the top of the stairs, a room behind the second story mural sits to the west of the house and if not for the overgrown foliage, would gaze across the gorgeous landscape and peer over the water on the south side beach. Meandering through the house I passed several other large rooms with fireplaces in each, in total I counted about seven. For such a warm climate, I could absolutely not understand why any house would need so many fireplaces. 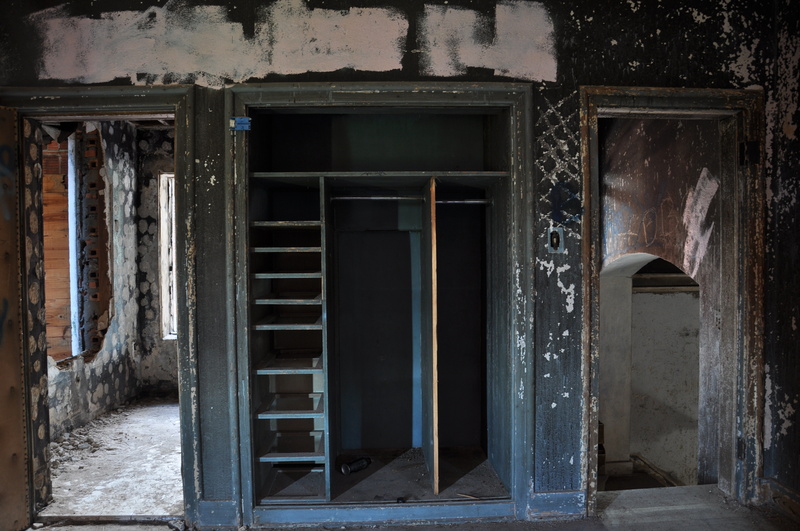 The house appeared to have been updated with electricity sometimes during its lifespan but not with anything more than lighting and a few plugs. Walking down the stairs, I made my way back out to where the courtyard was. The driveway in which I parked sat directly in the middle of the gorgeous archways separating the sides of the home. On the North side of the house were other rooms that no longer had a roof over them, used for caretakers and guests when it was active. There were even what appeared to be the remnants of a garage. Majority of the rooms are completely over grown with weeds but on the west side of the house was a gorgeous walkway. In the construction of this home, all of the tiles were all taken into consideration and carefully laid. To east side of the house a room with only a fireplace and windows that face the lake and near the lakeside is where the great pirate’s treasure is said to be buried. 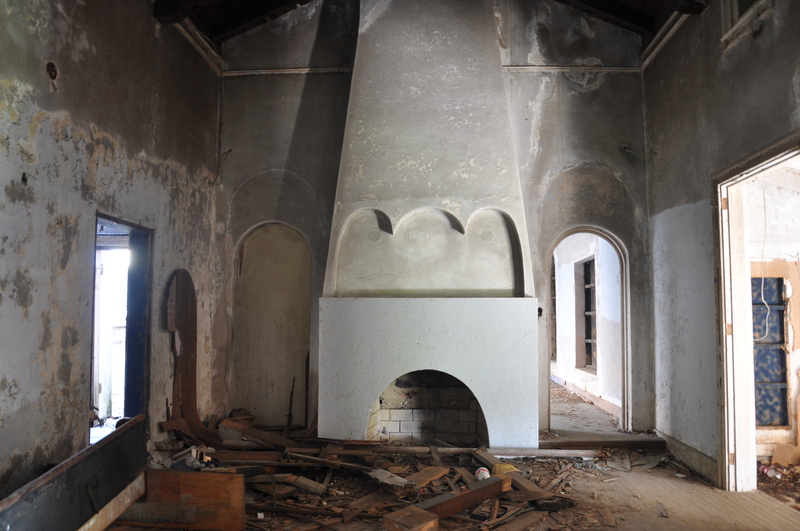 Although the treasure story has never been proven or disproven, it adds a bit of an aura to the once-great house on the island of many stories. As I got in my truck and drove out, I made the circle through the arches of the house and made my way to the archway that marked my entrance before as it now marked my exit as I left, standing alone on the road with nothing but the pillars of the fence line to keep in company at the roadside. This entry was posted on June 18, 2012 at 6:00 am and is filed under "A worldwide secret organization...", Guest Photographers, Guest Writers. You can follow any responses to this entry through the RSS 2.0 feed. You can leave a response, or trackback from your own site.